MIAMI, FLORIDA, UNITED STATES, June 13, 2018 /EINPresswire.com/ -- Connie Goodman-Milone is a noted writer and a credentialed social worker whose poetry has appeared in hospice care and health-related journals, as well as some conventional literary ones. Born with a uniquely compassionate spirit that was molded by both her family and life events, Connie today uses her skills in the most influential ways—particularly when it comes to helping people cope with painful illness, loss, and the grieving process. As Mother Teresa once said, Not all of us can do great things. But we can do small things with great love. Connie certainly has done that. When publishing her own poetry, judging others’ writing, and serving in her writers group, Connie has enabled people to understand, share and validate their emotional experiences. In this second half of her six-part series, Connie will read hers and other’s poems, and explain how she participates in bereavement support, nature-focused poetry and social activism, and random acts of kindness. In the first show, Connie will help listeners learn to assist those who have had a loss or to find support for themselves. 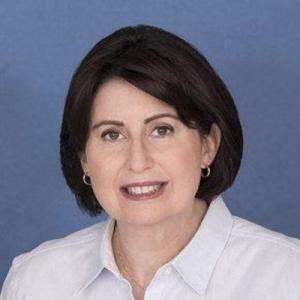 She will discuss various bereavement support groups available in and beyond Florida (and even on social media) that can help people understand their feelings, cope with their grief, and make new connections. She will talk about specialized groups like Children’s Bereavement Center, for those who lost a loved one at a tender age, or Compassionate Friends. She will also discuss current events--such as celebrity suicides, volcanoes and earthquakes--and how such tragedies make death and family such a perennial topic. In the second show, Connie will talk about her love of nature, and how it is a source of poetic inspiration, particularly when it comes to the format known as Haiku. A well regarded and published writer, Connie will read some of her work and discuss other poets and writers--like Mary Oliver--that she especially admires. She will also touch on the ways nature poems can create social awareness and the place poetry has in the environmental movement. Be sure to listen in, to hear her contest-winning entry about the heart-rending dying off of the bees. In the last of her three segments, Connie will talk about random acts of kindness and why they are so important in the world today. She’ll relate stories with a compassionate essence about the little things she’s done to brighten the day of a hospice patient or family member, and others in her everyday life. She’ll remind all of us of the significance of random acts kindness and senseless acts of beauty and relate the origins of a famous quotation about this. When Connie was named a Marquis Who’s Who Humanitarian of the Year in 2017, she observed “It is so wonderful to know there’s a place for caring people in this world.” Connie also has a book in progress, Bereavement Poetry Project, that she is co-authoring with Jonathan Rose. 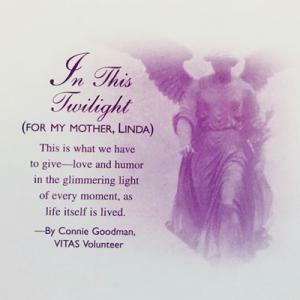 Be sure to tune in to learn all that this wonderful woman and hospice volunteer has done to support others—all the while maintaining an inspired career as a poet and writer.